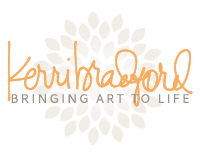 So, I have a new project up over at Kerri Bradford Studio today. Here's the thing. It's not at all what I set out to originally create. But I did manage to turn it into a happy accident, even though at times I was *THIS* close to giving up. Kerri offered up a little color challenge to us, if we were interested in playing along. The color choices were grey and aqua, and she had attached some super cute grey and aqua images for inspiration. I loved the idea. But at the same time, I wasn't sure how I would work that on a layout, since I couldn't think of any photos that would go well with it. Then I had this bright idea to create a 6x6" mini album. I was going to cut a bunch of 6x6" backgrounds, using some of my favorite background cuts from Kerri. I would adhere those all to 6x6" white cardstock pages. I was going to do a "favorites" kind of album, and had some themes picked out for each page, pulling from Kerri's titles/words, and even from some of the free shapes that we get thru her The History Project class. Things like movies, television shows, food, music, etc. On the second page of each spread, I would include a 6x6" photo collage using Kerri's Storyboard Templates, filling in some of the openings with text. I even Instagrammed this photo of some of the background pieces I was cutting. I cut every single piece from white cardstock to make things simple. Although her challenge was to use grey and aqua, I thought it would be fun to make each spread in the mini album a mix of grey and another color. Grey and aqua on one, grey and yellow on another, grey and green on another, etc. I pulled out my small collection of Heidi Swapp's Color Shine Spritzers, and went to work misting each and every piece with either Tinsel (silver, which was my "grey") or one of the 6 colors that I own in her spritzers. Then I realized I had time constraints that were working against me. Not enough hours in my day, unfortunately, and I haven't quite figured out how to add more hours yet ;) So then I thought that instead of the mini album, I would simply create a two page layout, using divided page protectors that have four 6x6" openings on a page. I chose 8 of the 6x6" pieces and laid them all out to work with. Then somewhere along the way, I once again made an executive descision to change my mind switch to a one page layout. Indecisive much??? I chose to go with 4 of the silver background pieces to create the base of the page, and stuck with just the hearts (from the Hearts Background kit) and the circles (from the Background Basics kit). I had already stapled these background pieces to 6x6" pieces of white cardstock. A few staples in each corner is all that's holding them in place. No extra adhesive used on them. Instead of prying staples up, and removing the background pieces to adhere to a full sheet of white cardstock, I simply adhered those four 6x6" squares to a sheet of scrap cardstock. Then I picked out another 6x6" piece to add to the center of the page. I loved the yellow sunburst background (from the This & That: Freedom kit), so it was an obvious choice to use. I had also already adhere the "2013" (from the twentyTHIRTEEN kit) and the "me" (a freebie from The History Project class), both of which I had spritzed with the Tinsel color. So those were staying put. To make that center piece stand out a bit more, I took out some Heidi Swapp banners and pulled out two of the large scalloped banners. They're more like a border I think, since they're straight. I cut each one in half, so I could make a border around my entire center 6x6" piece. I spritzed each one with the Mustard spritzer to match the sunburst. I added some simple embellishments sprinkled from the top left corner, diagonally down to the bottom right corner. A few fun buttons from Jenni Bowlin, some colored rhinestones from Teresa Collins, and some glittered dots from SEI. And what I ended up with, working with what I had and with the changes I kept making, was a fun divider page for my All-About-Me album. Which is actually a smart thing to have, since when you look through my All-About-Me albums (I have two, which include any layouts I've created about myself), all of the layouts tend to blend together so easy beause the majority of them don't even have photos on them. I think having a divider to seperate the years will help break up the albums a bit, and give a clear indication of what time in my life I created each layout. I thought I would share one of the two layouts I created for this issue. This layout was for the 3-Designer Challenge, where three designers were given the same exact set of products to work with. We had the Down By The Shore paper collection by Fancy Pants, a fun die-cut placemat from Jillibean Soup, a stamp/die set from Sizzix, small striped accents by Queen & Co, Thickers from American Crafts, and textured cardstock from Bazzill. This is my take on the challenge. You can check out Emily Pitt's layout and Lisa Dickenson's layout inside the summer issue. I knew right away that I would likely keep most of the die-cut placemat in one piece on one page of my two page spread, so I figured I would make a photo collage to include lots of photos for the other page. I used a storyboard template from Kerri Bradford to create my collage. I hand cut some flowers from one of the floral patterned papers and adhered them here and there on the placemat. I'm not a huge fan of fussy cutting, but every now and then you just have to do it. And usually, it's worth it. I honestly hemmed and hawwed over how I wanted to use the die-cut placemat for days. I was scared to cut it, unless I was completely sure about how I was going to use it, since I only had one of them to work with. I wasn't sure about using it all in one piece. The only thing I knew for sure was that I wanted to leave it white. I finally decided to cut off a few inches from one side to use on the second page, and kept the larger piece for the first page. I used a lot of the solid sides of the patterned papers for pops of color, along with the cardstock. I cut different sized circles to randomly fill in the holes in the die-cut placemat. Some of them I adhered under the placemat and some of them I added over the holes. I ran some of the circles thru my Cuttlebug, using the bubbles embossing folder, for extra texture. Kind of goes with the pool/water theme of the layout. Since the white foam Thickers were a smaller font, I used them in some of the larger circles to add a few descriptive words and the year the photos were taken. I added a few of the striped flower accents, and used the stamp and die for my title piece. This month we have started a few new features over on the Bella Blvd blog. 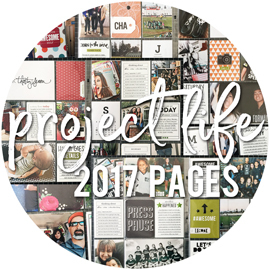 One of those is called "Project Life: Bella Style", where we ask our designers to be inspired by the Project Life concept in whatever way they choose to be. 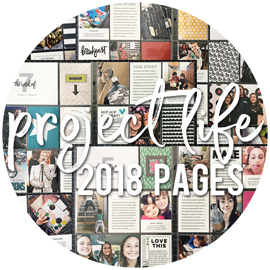 This might be keeping up actual Project Life albums, using Project Life components on regular layouts or even cards, using divided page protectors for everday layouts, etc. Today, I'm sharing my first take on the theme. I haven't done an actual Project Life album since 2009, but I have still managed to collect a huge assortment of divided page protectors over the last few years. I have used them quite a bit in my vacation albums, sports albums, and school albums, but have only used them for actual layouts a few times. I think part of the reason I don't do it that often, even though I LOVE using them, is that then I have to plan for what will go on the backside of that divided page protector. And since I have never been one to scrap in order, I worry I'll never get around to completing that backside. But honestly, if I wait to use all of these divided page protectors until the day I come up with an awesome plan, I will never, even use them. Because my life is too busy to sit and come up with an awesome plan. Lol. So, I have decided that if I want to use a divided page protector for a layout, I'll just do it. The girls and I have had a few days out together recently, doing a bit of back to school shopping. I usually have a lot of wait time, as the girls are browsing, trying a million things on in the dressing room, trying to decide what they like and don't like. All that fun stuff. And I have this nervous kind of energy, where I can't just do nothing. There's only so much I can do to entertain myself, so I have taken to taking pictures with my cell phone, and Instagramming (is that a word?) them in the moment. I thought it would be fun to take some of those photos and get them on a layout. I decided to use THIS divided page protector for my page. It's from WRMK, and it has eight 3x3" openings and a 6x12" opening. I knew I wanted to print my photos in squares, just like they've been seen on Instagram, so the 3x3" spots were perfect for those. I also used a few 3x4" cards from Bella's new Daily Details patterned papers, and simply cut two of the cards down to 3x3" to fit in alongside the photos. I knew the 6x12" middle section would be for my title, journaling, and some embellishments. I also knew I wanted to use the ruled patterned paper from the Snapshots collection for this section, but quickly found out that the large opening was actually more like 6x12.5" or so. So I had to add an extension to make my paper wide enough to fill the space. I used a mix of older purple chipboard alphas and newer green chipboard alphas for my title. Then I pulled out the black star die cut from the Paper Pieces die cut package, added a punched circle from the purple flower patterned paper, and topped it with an older aqua flower. I finished off the page with some stickers, designer tape, and small jewels. It was fun to mix it up a bit, and try something new, like the divided page protectors. Rather than creating a layout on one big sheet of paper, I created on lots of smaller pieces of paper and just slipped them into their pockets. I will definitely be doing this more often. I kind of feel like I've been sharing my Bella Blvd projects with you forever. Lol. As much as I LOVE Bella (and I really, really do! ), I do want to switch over to some other things here as well. Turns out, this is my last CHA layout to share. I must have lost track, since I thought for sure I had more than one left. And out of the 9 layouts I created for CHA, this was the one and only layout that I used my own photo on. I cannot thank my friend Krista enough for letting me scrap her gorgeous photos of her adorable family! There are just times that I find myself at the bottom of my photo piles for certain things, and some fresh and fun photos are more inspiring than turning to my same ole' photos I've used before. And even though I have used this photo of my girls from Halloween a few years ago, I knew I had to use it on at least one of my layouts with the new Trick or Treat collection. I love a good Halloween collection that works in colors other than just black and orange, and I love that Bella has aqua in the mix. It worked perfectly with this photo, since my girls had aqua in their costumes. There were so many different patterned papers that I wanted to use on this layout, so I choose four main papers and randomly cut blocks of varying sizes. No ryhme or reason to the sizes. Just very random cuts into squares or rectangles. Then I matted my photo onto the white grid patterned paper, and started layering all of the other patterned paper pieces around the photo. I also had the "Hello Halloween" card that I cut from the Daily Details paper to use for my title, and layered that in next to the photo. I added the large yellow star die cut from the new Paper Pieces die cut pack, and a few stickers from the different sticker sheets that go with the collection. The orange border stickers are from the Alpha+Bits sticker sheets. I did pull those from two different sheets of stickers, since each sheet only has one of each border. Then I finished off the page with lots of threaded buttons. And a quick Halloween card as well. This one was super simple. The "frightful" piece is a die cut from the Paper Pieces die cut pack, and has the cut out heart in the bottom corner. I backed that with a punched circle of black dotted paper, and then pop dotted the entire thing on the right side of the card. The half circles you see were punched from the large polka dot patterned paper. I love using that sheet to punch out the circles, since they all coordinate with the papers, and are an easy way to add bits of additional color here and there. A one inch circle punch works perfectly. 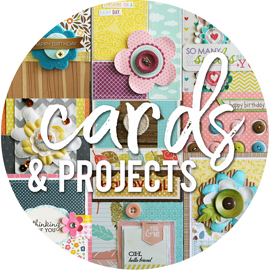 I cut those circles in half, and adhered them as a "border" of sorts in the center of the card. If you're looking to get your hands on Bella's new Trick or Treat collection, you can find it HERE. I still have a few more Bella Blvd projects from CHA to share, so I thought I would try and knock those out this week. Not that I have a ton of other things to share. Lol. But I did just print out some photos and am hoping to squeeze in some layouts just for fun. This is another one of my layouts using the new Daily Chevies & Everyday Bits collection. As I was browsing thru some photos from my friend Krista, these photos of her youngest daughter, Emily, caught my eye. Her outfit was the perfect match for the patterned papers that I had in mind. Her cute black and white striped dress, the pink boots, and her fun green knit hat. Plus, she's just an adorable little girl, and that's all the reason I needed to scrap some more photos of her! The white and grey triangle pattern makes a great background paper. I cut four strips of the black star patterned paper and adhered it around the edges of the page (a great paper saving trick that I have shared before HERE). I knew I wanted to add a few feathers to the layout, so I picked out a green, pink, and black feather. I layered them together and tucked them under the chevron paper strips, stapling the bottoms to secure them in place. I added a chipboard heart and the crochet heart to help hide the staples. I hand cut a few chevron pieces from the green and pink chevy patterned papers. I wanted a light and dark row from each, so I left them together as I cut. I then cut one black chevron from the black and white chevron patterned paper and positioned it between the green and pink rows. The arrow stickers are a fun addition to the Daily Chevies collection, and they come in four colors. I used a few of the green and pink arrows beside my title. The journaling card is a 3x4" card from the backside of one of the chevron papers. It actually has an aqua geotag in the upper left corner, which I covered up with the grey crochet heart. I machine stitched around the outside edge of the journaling card before adhering it to the page. I then finished off the page with lots of threaded buttons in coordinating colors. Since today is the girls first day back at school, I figured maybe it was about time I shared a few photos from last school year's graduations. Better late than never, right? Sarah. Our 8th grade graduate! It seems like just yesterday that Alyssa was graduating from the 8th grade, yet three years have gone by and it was Sarah's turn. She looked gorgeous in her gown, and proudly wore the silver cord for making honor roll. The entire class at the start of the ceremony. Since they walk in by height order, and Sarah's a little on the tall side, she ended up in the 5th row. So you can't see her here, but trust me, she's back there. Accepting her promotion diploma from the school's principle. One of the neat things about her class, is that it was the first class to go all 9 years at the school, from Kindergarten thru the 8th grade. When the school opened up, Sarah was in Kindergarten. They even took a group photo for the yearbook of all the kids in her class that had actually been there since Kindergarten. Suprisingly, there were only about 18-20 of them (out of about 90 that were graduating). The previous principle of the school that was there at the beginning came back for graduation, and this is Sarah shaking his hand. Jump ahead to some photos of Sarah and her friends. She has a great group of very close friends, and they have all stayed friends over the years. Some have been friends since Kindergarten. Sarah and her big sister (even though technically Sarah is taller/bigger). Family shot that doesn't happen often enough. And the next night, Alyssa was back at her own school for high school graduation. No, she didn't graduate (don't rush it!). But she's in the band, so they play for and get to attend the graduations. She shared some of her photos from the night (all iPod pics and cell phone pics). Alyssa, Ruby, and Damon. These three have been friends since Kindergarten. And they've all been in the band together since the 5th grade. She's got a huge group of band friends that are her core group of friends in high school. Or as any of them will tell you, they're all really like a big, musically gifted family! Alyssa and Stephanie. I believe it was a bit windy that evening. This was their last time having to play Pomp & Circumstance for a graduation. EVER. Well, for most of them. Some of these friends are still sophomores or even freshmen, so they'll still have to play. But I know Alyssa was excited to be done with that song! And then there were a few graduating seniors, all fellow band members, that Alyssa had become really good friends with. Alyssa and Clayton. And Alyssa and Anna. These two played in the band together, played against each other in city soccer for years, and played together in high school soccer. That's a quick look at how our last school year ended. It all goes by so quickly, and almost feels like a blur sometimes. Summer flew by too, and it's weird that they're already back in school. I can't wait till they get home so I can hear how their day went! This week has been pure madness around here. I have one of my previous daycare girlies here visiting this week and next, making it a lot more hectic around here. The youngest in the group just turned 1 years old last week, which means I officially have four 1 year olds in the house, in addition to the older ones. The last 2+ months of summer break is wearing on me, and I think I'm ready for a break from everyone at this point. And my girls go back to school tomorrow, which means the last week has been a blur of activities just leading up to the first day of school. Link Crew meetings for Alyssa (leadership), freshman orientation for Sarah, Round-Up days for both the girls (where they get their schedules, turn in forms, have school pictures taken, pay for all the stuff that needs paying for, etc. And they've both had three days of band camp, along with fall soccer starting back up last week. It's a lot of running them back and forth, and I appreciate having Grammie, Papa, Aunt Kathy, and a few other mom's there to help out with that part of it. Anyways. 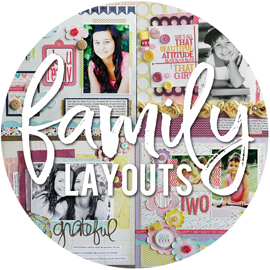 I thought I would take a minute while the kids are napping and share a quick layout. This is another one of my CHA layouts for Bella Blvd, using the new Daily Chevies & Everyday Bits collection. This collection has five fabulous tone-on-tone large chevron patterned papers, along with a black and white large chevron pattern as well. I got the bright idea to fussy cut a few chevron rows from each of the five tone-on-tone papers, and then piece them back together to make a colorful chevron pattern. It did take a while to cut all of those chevron rows out. After I had quite a few cut out, I started arranging them on a sheet of white cardstock. I used some of the lighter colored rows and some of the darker colored rows, and spaced them so there was a small gap in between each row. Once I was happy with the combo, I adhered them all down, covering the entire sheet of cardstock. I think I had a bit different idea in my head when I started this, and thought more of the sheet would show. After deciding to only use the pieced together chevron pattern on the sides of the page, I simply used my trimmer to cut off a 2" wide section off each side of the sheet. This left me with an 8x12" piece of this pieced together sheet that I can use for another project. I wanted to add a touch of patterned paper along the sides as well, so I pulled out a pink flower paper from the Play Date collection and the aqua dotted paper from the Christmas Countdown collection. The white grid paper is from the Trick or Treat collection. I finished it off with a chipboard border and alphas for the title, a few feathers (both are white, even though one looks a bit cream from the yellow paper behind it), a crochet heart, a few buttons and some stickers. 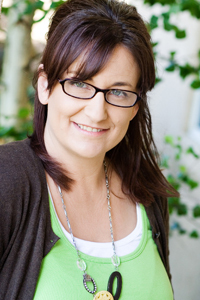 Since this is Kerri's birthday celebration week, it only made sense in my mind that I would create a birthday layout. I have plenty of birthday's that I have yet to scrap. I think a lot of times, I put off doing them because there are just so many photos to sort through and narrow down. And I always look to get as many photos onto these birthday party layouts as possible. I have always kept my birthday party layouts more on the simple side. Lots of photos, just a little bit of journaling, and minimal embellishing. 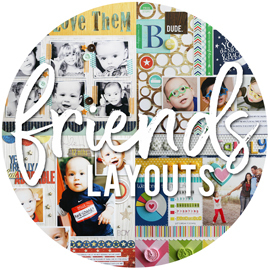 I started this layout by enlarging the group shot of the birthday girl, Sarah, and her friends. I had this printed as an 8x12" photo for the first page of the spread. I really love mixing a chunky font along with a cursive font for my titles. I am loving using Kerri's Weathered Door alphabet kit for half of my title. Then I sift through Kerri's many kits that feature words and phrases in her own handwriting, and find the perfect cursive word for the other half of my title. I used Kerri's Enjoy The Sunshine shape (just 99 cents!) to create the sun. I just used part of the shape, and then turned it upside down so that it rests at the top of the page. And then there is the second page of the spread, which is ALL photos. I used a 12x12" template from Kerri's Storyboard #7, which held fourteen photos. I was originally going to create another collage, using this same template, to add to the backside of this page. But I'm now thinking that I might use a smaller divided page protector (maybe a 6x12 that would hold twelve 3x4' photos) and just slip it between the two page of the spread. I just know that I have a few more photos that I want to include, but I just ran out of time to get them printed for this. If you haven't seen yesterday's post, make sure and check it out and get yourself entered in the giveaway! I used a mix of alphas for my sentiment. The "new home" alpha stickers came from the Snapshots Alpha+Bits sticker sheet, and the "congrats" and "on your" came from a few sheets of High Five alpha stickers. I knew I wanted to use the polaroid frame from the Paper Pieces die cuts on a card. I backed the open part of the frame with the cloud patterned paper, and also added a little piece of the yellow heart paper behind the open heart on the bottom of the frame. I machine stitched around the frame, and then added a few phrase stickers to the frame as well. A few chipboard alphas in the center of my frame, along with the "friend" stickers from the Alpha+Bits sticker sheet finished made up my sentiment.